The Superfly Hotels iPhone and iPod Touch app combines your existing reward accounts with a Superfly bonus to earn money as you travel for business and pleasure. The modern, streamlined interface and the intuitive navigation make saving money stylish and simple. You can create an account or use a Facebook authorization. The Facebook sign-in requires access to your likes, status, events, profile, and check-ins, as well as your friends’ likes, profiles, current cities, and check-ins. A pop-up requests the ability to post on your timeline, but you can opt out with a touch. The first stop in maximizing your cash back is the blue list icon in the upper left hand corner of the home screen. With a touch, a menu of options slides over the screen from the the left side like Facebook. You touch the add accounts icon. You can use an email inbox search that is currently in beta or add accounts manually online at superfly.com. I selected the email inbox search, but the delay was significant. It searches your inbox for the latest updates from your rewards programs. With tweaking from the beta process, it will hopefully operate more successfully in the future. In the meantime, you can add accounts online. The selections are impressive. You can choose from 61 airlines, 11 hotel chains, 8 car rental companies, and 8 credit card companies. When you use the Superfly Hotels iPhone app, you automatically earn a small amount back. When you add your reward account information, those promotions enhance your cash back potential. After you have accrued at least $100 in cash back, you can redeem it. The home screen is simple and sleek list. For each option, you will find the following information – the hotel name, photo, ratings, distance, average daily price, and cash back. You scroll through the options with vertical swipes. The search is automatically performed based on your current location as noted via location services. You can change to a different destination with a touch on the search icon in the upper right hand corner of the screen. A new interface appears, and you can adjust the check in and check out dates with simple touches. To learn more about a hotel, you just touch it and you are transported to a new screen. For each hotel, the interface is concise, attractive, and easily navigated. The name of the hotel with the rating is at the top of the screen. Just below, there are three tabs–book, info, and map. With a touch on the tab, the screen’s content adjusts appropriately. The info screen is a narrative overview of the room, hotel, and amenities. The map view pinpoints the location of the hotel. The book screen has a slideshow of thumbnail images, the dates available, the price of the room, and the cash back earned. You press the book it icon to secure the room. The final price including taxes and fees is clearly presented, and the fine print is shared at the bottom of the screen. You enter your personal and payment info to complete the transaction. The process is simple and quick. 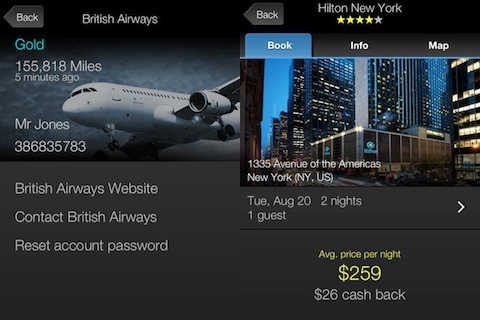 The Superfly Hotels iPhone and iPod Touch app makes saving money while traveling cool, hip, and fun. 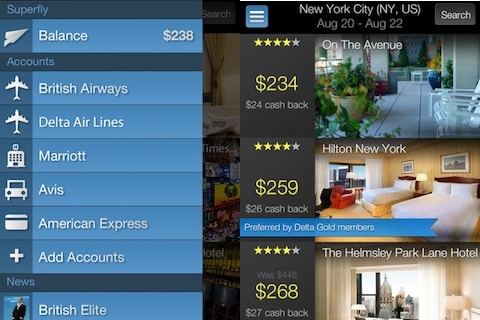 AppSafari review of Superfly Hotels – 10% cashback on hotel bookings, manage your frequent flyer miles on the go was written by Jenni Ward on August 29th, 2013 and categorized under App Store, Free, Travel. Page viewed 3692 times, 1 so far today. Need help on using these apps? Please read the Help Page.